Do you ever make too much rice and have leftovers you have no idea what to do with? I know I do. We usually cook more rice than we need. 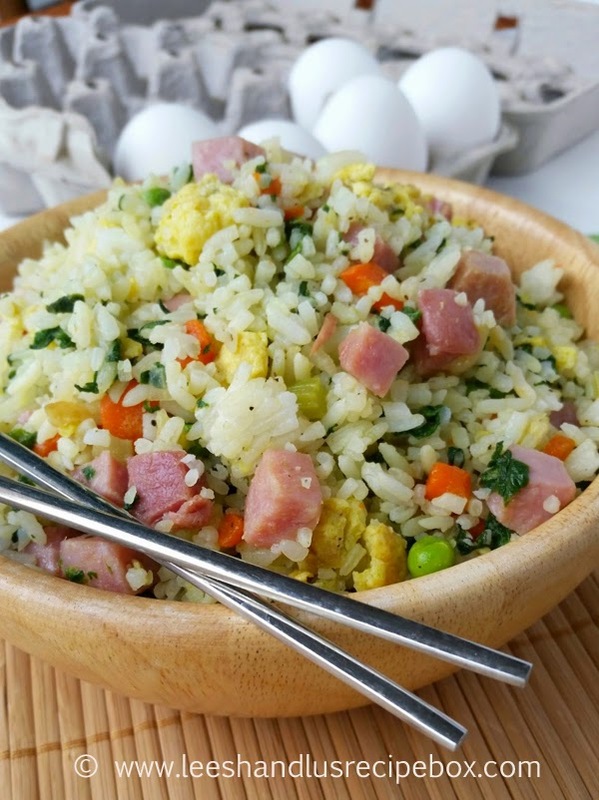 Leftover rice is perfect for this simple and tasty fried rice. 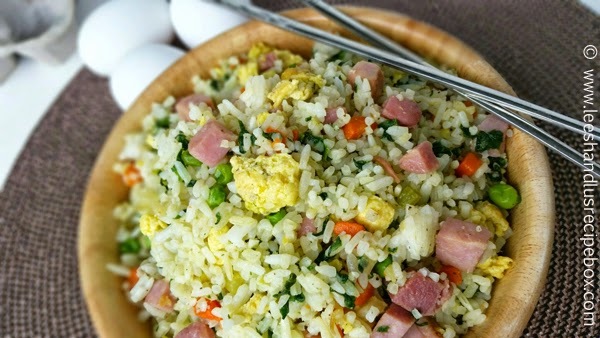 Fried rice is a family favorite, so much in fact, I'll even go to the effort to cook rice just to make this dish. 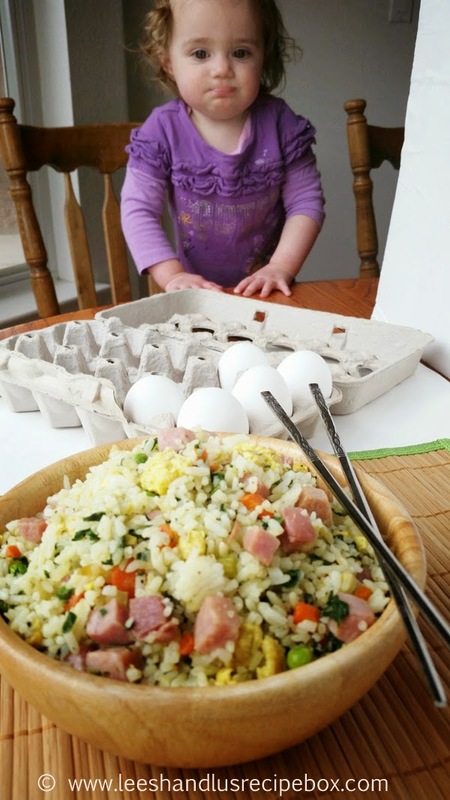 My uncle DJ was the one who got me started on fried rice. He makes it soooo good. He's a pro, really! My aunt, his wife, said she won't even do it, because it's so good when he makes it. I have tried to get his recipe written down, but he kind of just does it. So after he, well, mostly his wife, told me how to do it, we've tweaked it, tried it, tweaked it some more, and I've written down our basic method. It's easy, family friendly, and utterly delicious! There are lots of variations you can do with this simple dish. Sometimes if I'm in a real pinch for time I'll just add frozen peas to the mix of ham and egg. But when I'm wanting something a little more, I'll saute a little onion, garlic, celery and carrot. This particular time I even threw in some finely chopped spinach. I'll find any way to squeeze as many extra veggies/vitamins in. My kids don't complain. If they ask what they green stuff is, I just tell them it's seasonings and it makes it extra tasty. So far, my 1 year old has no complaints, and the 4 year old buys it every time. I love it when they gobble up something good! Makes me feel good! My 1 year old really loved it so much that she was ready to dive in while I took some photos. I think she really might have just wanted to grab all those eggs and throw them on the floor. She's a bit destruct-o, if you know what I mean. Love that sweet little face! I hope you'll enjoy this dish! And I'd love to hear what you think! Cook rice according to package directions. If you want the extra veggies, start by sauteing them in a large non-stick skillet - add olive oil and all the veggies you want, and saute until tender. Set aside in a dish. In a small bowl whisk eggs with water, and a little salt and pepper. In the same skillet you cooked the veggies, add a small amount of olive oil or butter until cooked, stirring as they cook. Remove from pan and keep warm with veggies. Add ham to the skillet and cook until lightly browned; this helps bring out some good flavor. 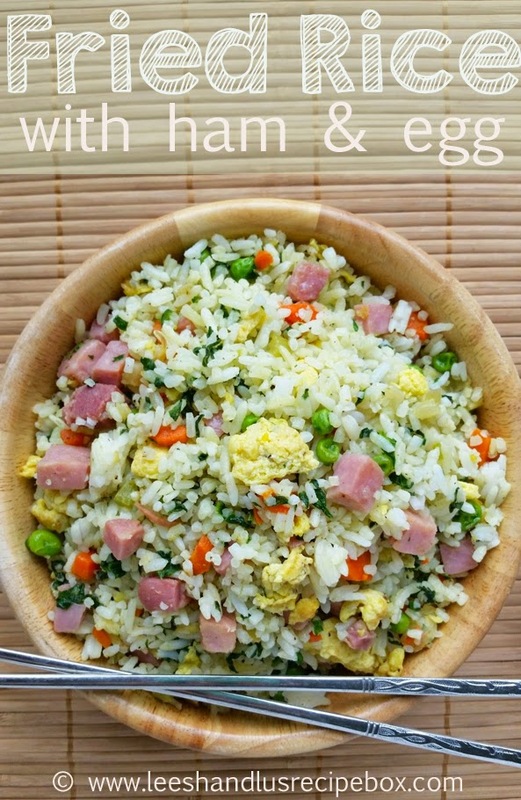 Add everything to the skillet with the ham, the rice, veggies, eggs, butter and garlic salt and pepper. Cook over medium heat stirring frequently and letting it brown a little and heat up evenly. Stir in soy sauce if desired. So happy to finally have a recipe written down! I'm making it tonight! I'm drooling a little. This gets two huge yums ( thumbs up from me) I'm hopping over from Maria's Fabulous Friday party and I invite you to share at my hop too. You can link up until midnight. Hugs!